hat sort of man was the leader of the expeditions into Arctic waters? 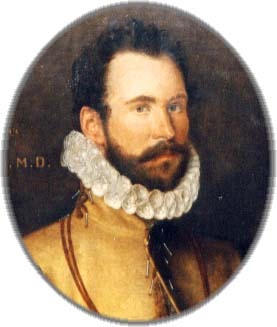 A portrait of Martin Frobisher, commissioned in 1577 following the apparent success of his first Arctic voyage, shows a tall, well-built, commanding figure - adventurer and warrior - a little impatient with posing. By birth he had connections to Yorkshire gentry and to a well-to-do London merchant family, and his career brought him in contact with some of the leaders of Elizabethan society. But he was not of their kind. He was not interested in schooling - remaining barely literate during his life - and was too undiplomatic, graceless and high-spirited for a career in business or government. So, as a teenager, he was sent off to sea, where his taste for adventure was stimulated by trading voyages to exotic destinations, violent confrontations with Portuguese rivals, and some time in a Portuguese gaol. It was on one of these expeditions he first encountered the Lok brothers. As a young adult, his violent and indisciplined character, combined with an ambition to make his fortune in whatever way he might, led him to abandon legitimate trade ventures in favour of privateering. This type of activity was licensed by the Queen, so long as directed against England's enemies; but Frobisher's readiness to exceed the terms of such licences for the sake of profit, crossing the boundary from privateering into piracy, led to his arrest and brief imprisonment on several occasions in the 1560s. He escaped a lengthy gaol spell by offering his services to the Queen: first to hunt down and arrest fellow privateers and smugglers, and later to assist military operations. But old habits were hard to break, and he reverted to privateering. He went from bad to worse, becoming involved in two treasonous schemes to aid the cause of Irish Catholics. Discovery forestalled both, although Frobisher managed somehow to escape punishment, perhaps because the English authorities appreciated his usefulness as a bold commander. Nonetheless, by 1574 he had lost the trust of the English authorities and his future prospects were uncertain. He may have had some interest in searching for a northern sea-passage through to fabled Cathay ever since his spell in a Portuguese gaol, where he heard a story about such a passage. But there is no sign it became his driving ambition. He probably only gave serious thought to it again when he renewed his acquaintance, in 1574, with Michael Lok, who was obsessed with finding new markets for English commerce. It was probably Lok who introduced Frobisher to cosmographer John Dee. Into the prospect for an expedition to seek out the Northwest Passage, Lok's connections brought his fellow merchants (members of the Muscovy and Mercers' companies), Frobisher's brought Burghley and other of the Queen's councillors - who, if not entirely trusting Frobisher, saw him as expendable on a risky project - while Dee contributed the scientific expertise. Mariners such as Christopher Hall were brought in to improve the level of navigational skills available to Frobisher, although it was not within Frobisher's temperament to like advice that went against his own opinions. Once in Arctic waters, Frobisher's personal aim for the modest first voyage may have been to return with enough evidence of a passage to persuade backers to give him a larger fleet for a return trip. He brought back a personal certainty of the passage's existence - having avoided going far enough to disprove his theory - an Inuit captive who excited some public interest in the venture, and a piece of ore which it was subsequently claimed bore gold. Whether Frobisher had any confidence in the assays leading to this claim - certainly he did not get on well with most of the assayers - is unknown, but it provided him with further argument for a second expedition. The consequence was, however, that the aims of the second expedition were diverted away from exploration towards mining. The turbulent Frobisher did not protest too loudly - instead proclaiming to the authorities that there was enough of the same ore to fill all the Queen's ships. This may reflect that his interest was not especially in discovering the Northwest Passage, but in acquiring glory through command (he hoped to be appointed admiral of the northern seas), and wealth through whatever means might be at hand, apparently including embezzlement of some of the expedition funding. His enthusiasm and determination showed itself in the second and third voyages in his courageous personal actions and forceful leadership at times of crisis, finding safe passage for his ships through extremely dangerous ice-laden and rough seas, and in the great efforts to which he pushed his men to mine and load as much ore as possible in the difficult Arctic conditions. The discovery that the ore was worthless made Frobisher and Lok targets for the dissatisfaction of investors in the voyages. Frobisher managed to side-step culpability once more, this time by blaming Lok (and others) in what turned into mutual recriminations acted out in the law courts. Lok was ruined. Frobisher was temporarily discredited and, as one of the investors, also lost money. He found little employment for several years until the growing hostilities between England and Spain again created the need, in 1586, for a bold sea-captain who, at this later stage in his life, had abandoned the worst of his past unruliness. He remained in royal service for the rest of his life. "a man possessed with the absolute will to achieve, yet lacking the intuitive qualities of the true achiever.... Frobisher promised much and achieved nothing of great note, but he did it with an energy which makes him a somewhat sympathetic character." He was not at ease or patient in his dealings with the courtiers, merchants, or scientists who were involved with the business and technological operations behind the expeditions, preferring the company of his mariners and the open sea. As a fearless and energetic commander who led by example and from the front lines - an imprudent quality which led to his death from a gunshot wound - he won the affection of his crews and was prepared to risk his own life to preserve theirs. Yet he was unable to inspire most of his officers, who (in the case of the Arctic expeditions at least) often had superior abilities and judgement to his own, and with whom he jealously competed for authority. Yet, to his credit, the third Arctic voyage in particular was a significant technical achievement, both in terms of navigation and of the conduct of a large expedition into dangerous, little-known waters, with very little loss of life. "Regardless of the array of disparaging charges made about him, Frobisher stands out as one of the most striking and colourful adventurers in English history, a remarkable leader of men and in his own way a visionary. The consequences of his actions, both intended and unintentional, have been considerable."